There is no shortage of resources online for truck bed build-outs, ideas for general designs, or essential equipment for living comfortably on the road. I’ve spent most of the past three years living out of a succession of vehicles from a partner’s Subaru Forrester, to a Honda Element, and my current 1998 Toyota Tacoma. Over that time, I’ve built two platforms for my own vehicles and helped numerous friends build out their trucks. All said, I’ve designed and built five platforms, each time trying to improve on the previous design. Although each design is different, the one constant is a focus on maximizing usable space in the confines of a vehicle. Although 2×4’s are cheap and easy to work with, they’re overkill for the majority of builds. When I designed the bed for my Honda Element, I used 1×4 boards and overlapped them in key spots to increase strength. In my current setup in the back of my Tacoma, I used 7/16 plywood for the majority of the build. Another way to make the platform stronger is to utilize the strength of the plywood by permanently screwing it into the platform frame, this way you use the strength of both the plywood and the frame and can use smaller lumber for both. The truck. I used a single sheet of 7/16 plywood for the main level. A set of five plastic bins and my cooler fit perfectly underneath. I’ve seen many builds that use blocks of dimensional lumber in the corners underneath the platform to give more surface area for attaching the plywood. The downside of this is that you end up with a large 2×4 taking up storage space underneath the bed. By using angle iron instead, you decrease the profile of the frame which in turn increases usable space underneath. Main bottom compartment. 1×1 angle iron as supports cuts down on the profile of the platform, allowing for more storage space. I’m fortunate enough to have friends who work as carpenters, so I have access to a full wood shop and all the tools necessary, but ultimately you can make a fantastic build with just a drill and jigsaw . Add a router and circular saw and you can build a drool-worthy platform. The jigsaw especially comes in handy when attempting to scribe an edge to fit a curved space. By cutting along the contour of the vehicle interior, you can maximize coverage and fill voids. Using a router allows you to recess compartments and rabbet joints to decrease the profile of the woodwork and save even more space. I like to measure the dimensions of things I know will be in my truck (i.e. specific boxes, water jug , propane tank) and design around that. It’s easier to build a platform that your gear fits into than to find gear to fit into a pre-made platform. Especially in a full-size truck or van, using cardboard to build a model of the inside can pay huge dividends before you make a single cut of wood. Use refrigerator boxes to layout and visualize what you’re building so that you can easily change the design to fit your needs. Water jug (propane tank behind) compartment. I measured and cut so that both would fit perfectly. Ultimately, only you know what you’re looking for from your build-out. I took it easy with my first build and kept it simple with just a plain platform and no drawers, compartments, or accouterments. 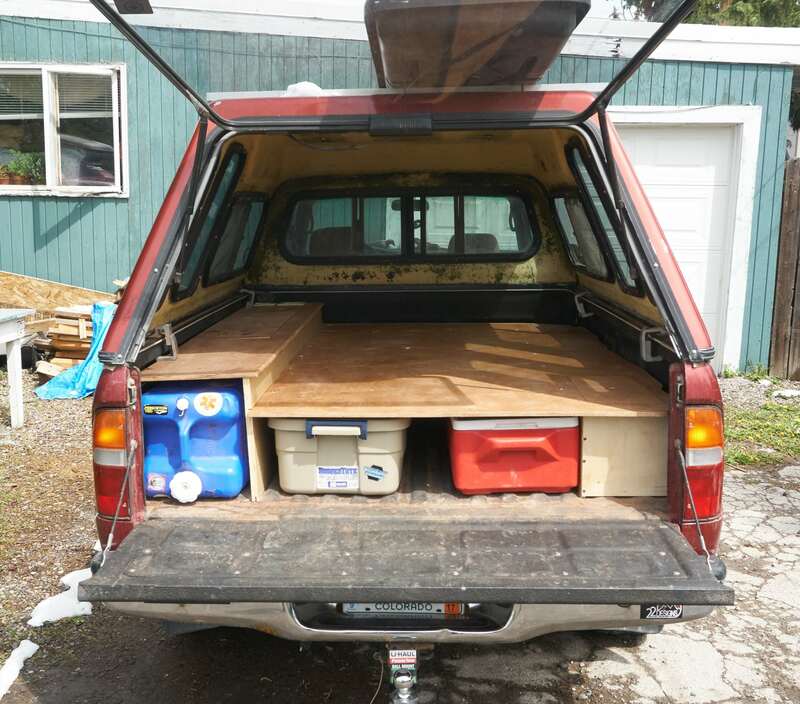 After living in that vehicle for over two years, I decided to build my next platform with multiple levels, four under-bed compartments, and a dedicated space for my propane tank and water jug, and I can still sit up straight in bed. All it took was a bit of time visualizing the space and figuring out how to interlock the necessary panels.